Description: One of BNSF newly rebuilt GP38's with their new logo. Yes I know it was a bad day. Title: Here's a shot of the new logo on GP38-2 2005 with the new logo and x-Santa Fe GP30 2460. Description: BNSF's Yale yard power. Description: Love the standard cab repaints!! Description: BNSF's Yale yard switching power. 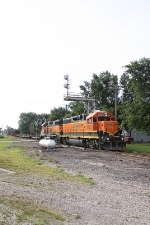 Description: BNSF 2005 works the yard in Marion. Description: Harvard yard switchers move a transfer over to West Memphis late in the day. Description: Switchers move past the railfans with a green to go. Description: Having waited for the manifest to pass, the switchers pass the waiting coal train. Description: BNSF 2005 switches a cut of cars in BNSF's Tennessee Yard. Description: Two geeps were used to shove the work train to the derailment site. Description: Waiting for the next assignment. 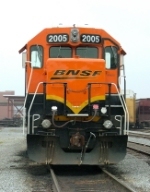 Description: BNSF 2016 & 2005 with a CABOOSE!, working the Dyno Nobel plant in Louisiana, Mo. Description: BNSF 2005 & BNSF 2911 with an old BN caboose idle waiting for the crew to arrive from the W. Quincy yard. Description: We meet again this time on the k line. Bnsf 2005 waits for the crew to get on to work the local chemical plant.